Our ties in Asia are over 20 years strong. During this time, we have been building relationships in Thailand and China to offer secure environments for our customers. Our Asian Foundry Sculpture Alliance has a proven track record of quality and client satisfaction. Do You Maintain International Foundry Standards? Yes. Sculpture Source Asia and the Paul King Foundry maintain high integrity and ethics while following the international standards of sculptors. We respect every component part of the model and all of the surfaces of the sculpture from the smallest to the largest. Conscience of the concept of economy and quantity, we want our clients to receive the best price for their works. Our international relationships can afford us the opportunity to always negotiate for you the best price at the highest quality standards. Our Asian Foundry Sculpture Alliance has produced many small to monumental scale bronze sculptures and we are particularly proud of our experience with public sculptures worldwide. Because of the technology available to us in our foundry in China, we can produce some of the largest high quality castings in the world. Our services include mold-making, enlarging, computer prototyping, fine finishing & patinas for sculptures up to 150 feet in height or more. 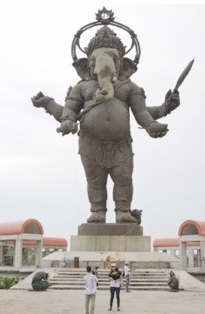 In Thailand, one of those is the 40 meter (130+ feet) tall Ganesh Buddha in Chachoengsao. The Paul King Foundry is focused on cost, quality and customer service. Our commitment to providing high quality castings, exquisite finishes, museum quality patinas and professional installations along with excellence in customer service at the lowest possible cost continues to bring us new customers. The foundry not only casts in bronze, aluminum and all other non-ferrous metals and materials, it also employs sand-casting and ceramic shell techniques.